Last month the Barna Group released the latest in its surveys regarding the use of technology in America’s Protestant churches. 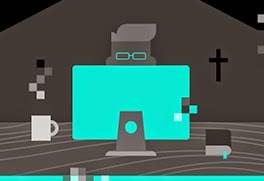 Entitled, Cyber Church: Pastors and the Internet, the report notes that an overwhelming number of pastors and church leaders are embracing technology in the church for both personal use and for ministry. Wanting to get a direct assessment of the use of technology in the church, I reached out to Phil Cannizzaro, president of InfoTank, an Atlanta technology services company. InfoTank serves the technological needs of many Christian institutions within the Atlanta-metro area. Clients include Peachtree Presbyterian, the largest church within P.C. (USA), having over 7000 members, North Avenue Presbyterian Church, Holy Spirit Catholic Church, All Saints Catholic Church, Ambassadors for Christ, an Atlanta-based evangelical ministry, Women's Community Bible Study, and numerous Christian schools including Holy Spirit Preparatory School, Atlanta Youth Academy, and Whitefield Academy. Cannizzaro was quick to point out that, in general, churches use the same technology as any other profit or non-profit companies. The difference is not what is used, but how it is deployed. One area that he points out is a significant driver of technology use is church membership management. This is an area that the Barna Group makes no reference to, but Cannizzaro says is a major concern for every church he services. Capterra, a business-to-business technology consulting firm, lists over 50 different software packages in the church membership management space. Varying in cost from a few hundred to thousands of dollars, these software packages attend to various needs within the church including membership management, accounting, tithe and donation management, sermon management, and attendance tracking. The more sophisticated software packages often have web server modules that allow members to directly access and manage their account, updating contact information and tracking church giving. As the Barna Group points out, the larger the church and the more financial resources it has, the more likely it is to adopt technology to offer services and solve problems. Cannizzaro notes that the churches that have greater economic resources are willing to invest in customizations to software packages whereas churches with fewer resources are more willing to use software as is “straight out of the box.” One last point Cannizzaro makes about church management software is that the software packages are generally three to five years behind in technology adoption. Even though the market is large for church management software, it has its limits and there is no incentive for being innovative. Only once a technology is ubiquitous in other areas of society, is it likely to show up in the church management space. In a 2008 report about technology use in Protestant churches, the Barna Group found that two thirds of churches had large screen projection systems in the sanctuary. Cannizzaro notes that his Protestant church clients also have projection systems in their sanctuaries and will use it in a variety of ways during services. One note of contrast, however, is that his Catholic Church clients do not have screens or projection systems within the sanctuary and have no interest in getting them in the future. Another Protestant/Catholic differences he finds in is the streaming of church services. Most of the Protestant churches he services broadcast their Sunday services on the internet. None of his Catholic church clients broadcast their Masses, and he said you’d be hard pressed to find many that do. It would seem while Protestant churches are interested in getting their Sunday Services to anyone in any way, Catholic churches are more focused on getting members to physically attend Mass and not participate through the mediation of online streaming video. The 2008 Barna report notes that just over half the churches surveyed use email broadcasting to make announcements and keep membership aware of church events. Cannizzaro says this is also an important part of the churches he services. However, the way email is handled is, at times, more sensitive than a commercial environment that might email indiscriminately. Cannizzaro says that there are two kinds of emails sent out, the bulk emails that are usually self-managed, and the emails coming directly from the church back office to the individual members. The self-managed email systems include the daily devotionals, and announcements from various ministries within the churches. An individual might be able to select emails from the youth ministry and to get updates on the church missions. Such self-serve email management results in members and non-members getting the information they want with little to no hassle for the church. The other kinds of emails, however, are sent out with more care. These are the emails coming directly from the back office and demonstrate the kind of care a church will have with its membership. Cannizzaro said it is not uncommon for the ministers or priests to oversee mailings to members, often changing the email or simply eliminating it due to their knowledge of the family and its circumstances. This is especially true when communication is about church giving. The churches want to be especially sensitive about asking for donations if they know the family is having a hard time or is not in a position to give. Barna’s 2015 report claims that pastors use technology and the internet extensively in the preparation of their sermons and other kinds of presentations. Cannizzaro noted that in the churches he services, all the church leadership embrace technology in their ministry, ranging from software with a variety of Bible translations, concordances, and the use of the internet to compare their take on a subject in comparison to sermons made by others. He also notes that for his clients, the use of smart phones, laptop computers, and tablets is common. A minister giving a sermon off a tablet or smart phone is a given. With this said, the use of screens and projections services do vary at his Protestant church clients. He noted that it is more common in the contemporary services for the projection screens to have slides and video supporting the service than in more traditional services. Another area in which mobile technology is becoming more common is instant giving. Cannizzaro claimed that more and more, congregants are asked to use their mobile technology to text or use some other means to give to a worthy cause, or support a church initiative. Other times the church will have laptops or tablets just outside the sanctuary so the members can give right on the spot after leaving the sanctuary. Having the technology to capture people’s willingness to give at the moment is significant and can really boost a chruch’s financial position. Not surprisingly, technology was a significant part of church missions. The communications that the internet provides allows participants the ability to report progress and experiences on mission directly to the membership at home. The accounts can be augmented with pictures and video. Combined with websites, email lists, and media services, technology allows members supporting missions to participate vicariously, and see how their donations are being put to use around the world. The Barna report found that only 11% of pastor’s interviewed believed the internet will provide all the religious needs of a person in the future. This is one point that Cannizzaro was adamant about. The technological services provided by his church clients were always in support of the in-person services of the church. The technology is to give members services that help them maintain connections with the church, but all the churches are primarily interested in encouraging members to come to the church and participate. This tension between physical and virtual participation is going to increase over the years to come. Moreover, as more and more people become accustomed to technological convenience in other areas of their life, they are going to demand similar conveniences from their churches. Today, technology is not seen in opposition to religion but is supportive. Over the years to come, more and more technology will mediate religious participation. Keeping track of how that technology is used will be important for scholars of religion. This is not a passing fad. It is only going to increase and is something we should keep in mind as we study the place of religion in America.